Twelfth Night is the night before Twelfth Day. "The evening of the fifth of January, preceding Twelfth Day, the eve of the Epiphany, formerly the last day of the Christmas festivities and observed as a time of merrymaking". Twelfth Night (5th January) is when all Christmas Decorations should be removed so as not to bring bad luck upon the home. If decorations are not removed on Twelfth Night, they should stay up all year. Why is Twelfth Night on 5th January and not 6th January? The Three Wise Men are not included in the nativity scene until January 6, Three King's Day. The nativity scene is traditionally not taken down until 2 February, Candlemas. 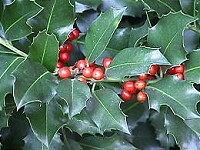 "There was another tradition in North Worcestershire when I was young of keeping the holly decoration until Shrove Tuesday and putting it on the fire when making the pancakes (when we still had open range fires in kitchens, of course!)" Click here to see photographs of the Twelfth Night annual seasonal celebration held in the Bankside area of London. "Thank you so much for all that information about the tree spirits and 12th night. I am glad to say that thanks to you they are all safely back in our garden--and we now know the right night to do it on ! !